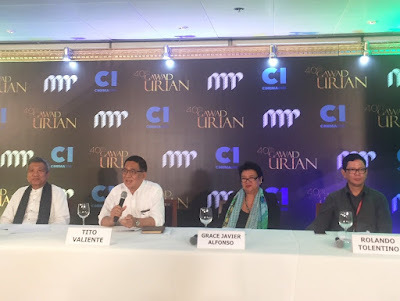 The Manunuri ng Pelikulang Pilipino has announced the nominees for the country’s much-awaited film award recognition, the 40th Gawad Urian, happening on July 20 at ABS-CBN’s Studio 10 and will be airing live on Cinema One. Leading this year’s list is the film “Women of the Weeping River” produced by Southern Lantern Studios, Haut Lesmains and TBA, with 12 nominations including best picture and best direction for Sheron Dayoc. “Paglipay,” produced by Milagros Ong How, follows with 11 nominations. “Ma’ Rosa,” from Centerstage Productions and Solar Pictures, “Pamilya Ordinaryo” produced by Found Films, Quantum Films and Cinemalaya Foundation, and “Ang Babaeng Humayo,” produced by Cinema One Originals and Sine Olivia Pilipinas, all have 9 nominations. 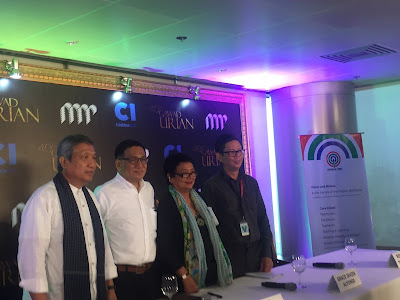 This year’s Natatanging Gawad Urian award will go to the Star for all Seasons -- Vilma Santos -- who won the most number of acting awards, a total of 8 best actress nods, from the esteemed body in the past years. Aside from “Women of the Weeping River,” the nominees for Best Film include “Ang Babaeng Humayo,” “Paglipay,” “Ma’ Rosa,”, “Pamilya Ordinaryo,” and “Baboy Halas” from Origane Films, Timewrap, Oya Film Productions, Alchemy of Vision, Lights Productions and Three Six-Zero Industries. The nominees for Best Actress are Charo Santos (Ang Babaeng Humayo), Laila Ulao (Women of the Weeping River), Jaclyn Jose (Ma’ Rosa), Cherry Pie Picache (Pauwi Na), Ai Ai de las Alas (Area), Elizabeth Oropesa (MRS), Irma Adlawan (ORO), Hasmine Kilip (Pamilya Ordinaryo), Angeli Bayani (Ned’s Project), and Nora Aunor (Hinulid). Khalil Ramos (2 Cool 2 Be 4gotten), Tommy Abuel (Dagsin), Bembol Roco (Pauwi Na), Garry Cabalic (Paglipay), Paolo Ballesteros (Die Beautiful), Ronwaldo Martin (Pamilya Ordinaryo), and Pepe Smith (Singing in Graveyards) are the Best Actor nominees. Aside from Dayoc, nominated for best direction are Lav Diaz (Ang Babaeng Humayo), Brillante Mendoza (Ma’ Rosa), Eduardo Roy, Jr. (Pamilya Ordinaryo), Zig Madamba Dulay (Paglipay), Bagane Fiola (Baboy Halas), Paolo Villaluna (Pauwi Na), Avid Liongoren (Saving Sally), and Lemuel Lorca (Ned’s Project). For best supporting actor, the nominees include John Lloyd Cruz (Ang Babaeng Humayo), Nonie Buencamino (Ang Babaeng Humayo), Taha Daranda (Women of the Weeping River), Christian Bables (Die Beautiful), Jess Mendoza (Hinulid), and Julio Diaz (Ma’ Rosa). Nominated for best supporting actress are Rhed Bustamante (Seklusyon), Barbie Forteza (Tuos), Sharifa Pearlsia Ali-Dans (Women of the Weeping River), Anna Luna (Paglipay), Joan Dela Cruz (Pagligay), Lui Manansala (Ned’s Project), Lotlot de Leon (MRS), Janine Gutierrez (Dagsin), Ma. Zimadar Caranay-Raper (Women of the Weeping River) and Meryll Soriano (Pauwi Na). Other categories in this annual film recognition include Best Screenplay, Best Production Design, Best Editing, Best Cinematography, Best Music, Best Sound, Best Short Film and Best Documentary. This year marks Gawad Urian’s 40th year in the industry. Since its first ever awarding ceremony held in 1977, it has become one of the most prestigious and most respected film awards in the country. The nominees and winners are chosen by the Manunuri ng Pelikulang Pilipino composed of reputable pillars in Philippine cinema led by its president Rolando Tolentino together with members Grace Javier Alfonso, Butch Francisco, Mario Hernando, Bienvenido Lumbera, Miguel Rapatan, Benilda Santos, Dr. Nicanor Tiongson, Tito Genova Valiente and Lito Zulueta. Catch the 40th Gawad Urian on Cinema One (SkyCable ch. 56, Destiny Cable Digital Channel 56, and Destiny Analog Ch. 37) on July 20 at 9PM. To see full list of nominees, visit www.cinemaone.ph or the official website of the Manunuri ng Pelikulang Pilipino (www.manunuri.com). For other updates, like Cinema One’s official Facebook page (www.facebook.com/Cinema1channel).